From 1967 onwards, Chӧje Akong Tulku Rinpoche introduced the West to Buddhism and various aspects of Tibetan culture. As a result of this, a wealth of material from one of Asia’s finest and most extraordinary civilisations became available to the world at large, ensuring its perpetuation as a living tradition, for the benefit of many. This work was based at the Kagyu Samye Ling Monastery and Tibetan Centre in Scotland, the first Tibetan Buddhist monastery in the West, developed jointly by Akong Tulku Rinpoche and Chogyam Trungpa in its first few years, and thereafter by Akong Tulku Rinpoche. Kagyu Samye Ling is a place of peace and spirituality, with a strong emphasis on active, selfless compassion, open to anyone of any faith. Since its inception in 1967 it has drawn visitors from all over the world. In response to a growing demand for teachings, Akong Tulku Rinpoche invited many of the greatest living scholars and meditation masters of Buddhism to Scotland. The Supreme Head of the Kagyu Lineage, H.H. 16th Gyalwang Karmapa visited Kagyu Samye Ling in 1975 and 1977, and appointed Akong Tulku Rinpoche as his representative in Europe, as well as making him Abbot of Karma Drubgyu Darje Ling, which is the monastery aspect of Kagyu Samye Ling. In addition to this, H.H. 16th Gyalwang Karmapa asked Akong Tulku Rinpoche to be the organiser of his 1977 six-month tour of Europe. Under H.H. 16th Gyalwang Karmapa’s guidance, Akong Rinpoche launched the construction of the Samye Project, the building of a major traditional Tibetan Buddhist temple and an accompanying college, library and museum. In 1975, H.H. 16th Gyalwang Karmapa indicated the site on which the temple was to be built, and H.E. Dilgo Khyentse Rinpoche later broke the ground for the foundations of the temple area. In 1984, H.H. 14th Dalai Lama consecrated the future temple and then returned again in 1993 to inaugurate the site for the college. Phase 1 of the Samye Project consists of the temple, built almost entirely by members of the Samye Ling community, under the active leadership of Akong Tulku Rinpoche, who was often to be seen with a trowel in hand on the building site. The inside of the temple was exquisitely finished by a team of fine artists, sculptors, woodcarvers and other craftspeople working under the guidance of the late Sherab Palden Beru, who was acknowledged to be the finest master-artist of the Karma Gadri tradition. The grand opening of the temple took place on 8th August 1988, with a commemorative plaque being unveiled by H.E. 12th Khentin Tai Situpa and Lord Steel. Senior representatives of the world’s religions attended. Simultaneously, Akong Tulku Rinpoche established the traditional four-year meditation retreat at Kagyu Samye Ling. The first two of these retreats were held at the Purelands Retreat Centre, also built by members of the community, and located in a secluded spot half a mile from the main Centre. After Samye Ling acquired Holy Isle (see below), the four-year retreat programme for women was transferred there, while the men’s retreat is now held at Glenscorrodale, a former farm-steading on the Isle of Arran. Purelands is now used for short retreat courses, teachings, and as a space for individual private retreat. During this period of Kagyu Samye Ling’s development, various satellite Centres and activities came into being. Kagyu Samye Dzong Centres and their branches were established in Belgium, Spain, Ireland, South Africa, Zimbabwe and the UK, and there are now Centres in many other countries. Akong Tulku Rinpoche would give a course in each of the Centres at least once every three years. The Centres were developed under his authority and guidance and he was tireless in carrying out the wishes of the people connected with them. At Kagyu Samye Ling, visitors always had the opportunity to see him personally for guidance and instruction, and he was known for his kindness, understanding and the skilful way in which he dealt with problems. 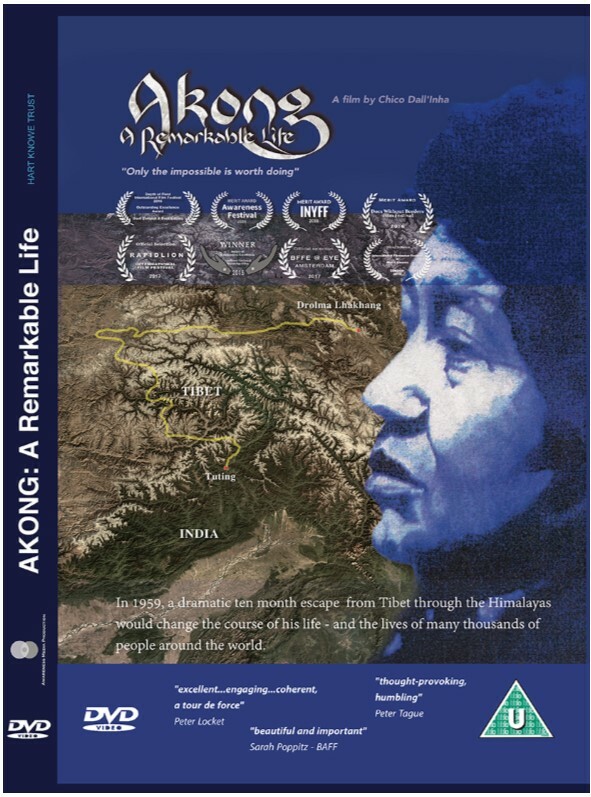 From 1990 onwards, Akong Tulku Rinpoche’s main activity concerned the expansion of his humanitarian work, principally in Nepal and Tibet, but also in Europe and Southern Africa, where he established several soup kitchens to feed the homeless in major cities. The increasing time dedicated to his charity work abroad led Akong Tulku Rinpoche to appoint his brother, Chӧje Lama Yeshe Losal Rinpoche, as Abbot of Kagyu Samye Ling in Scotland, and he has since been successfully strengthening the monastic community there. Phase 2 of the Samye Project was completed before Akong Tulku Rinpoche passed away. It comprises the college, library and new accommodation, and is an essential part of Kagyu Samye Ling’s growing activities. Samye Ling is fully committed to the Buddhist way of offering Dharma teachings free of charge, and to providing long-term support for its Sangha. In 1992 Kagyu Samye Ling acquired Holy Isle, off the West coast of Scotland, which has grown to be an internationally-renowned Centre for retreat and inter-faith work. Holy Isle has an ancient spiritual heritage stretching back to St Molaise in the 6th century. At the North of the island there is the Centre for World Peace and Health where an ongoing retreat- and course-programme takes place. Overnight guests are welcome to stay at the Centre, which has guest-house facilities. A closed Buddhist retreat takes place at the South of the island. Holy Isle is divided into several areas, some of which are reserved for birds and animals, others for our native tree-planting programme. The Holy Island Project is committed to restoring and maintaining the island’s natural ecology, and a comprehensive conservation programme is in place. Akong Tulku Rinpoche constructed a Victory Stupa at Kagyu Samye Ling, which was consecrated in the year 2000. A stupa (or ‘Cho-ten’ – Tibetan for ‘basis of offerings’) is a 2,500-year-old Buddhist tradition introduced to promote harmony and well-being. The measurements of the outer form have to be extremely precise and the inner contents specific and properly placed and consecrated because they symbolise the enlightened qualities of buddha. The outer form incorporates different shapes representing different qualities, and purifies and balances the internal and external elements. The Victory Stupa at Samye Ling signifies victory over all our negative thoughts. The inner shrine is open to visitors during the weekends. It offers space for the remains and ashes of those who wish to be laid to rest either within the Stupa or in the Prayer Wheel House. A high Lama visits each year to consecrate ashes placed in the Stupa during that year and to conduct a Blessing Ceremony. Surrounding the Stupa is the Prayer Wheel House which was completed in 2007. The prayer wheels were made inside the Stupa by people observing strict precepts and the whole project took over two years to complete. Each of the 45 prayer wheels holds more than 32 million mantras (short prayers). Tara (Tib: Drolma) is known for her healing energy and her protection for all beings and the planet as a whole. In Tibet, Tara is seen to be a female manifestation of the Buddha’s enlightened mind and energy and to have the complementary female power of the Bodhisattva of limitless love and compassion, all-seeing Chenrezig. As part of his medical activity, Akong Rinpoche initiated plans for the Tara Healing Garden which is currently under construction. The garden is dedicated to the 21 emanations of Tara and will preserve and propagate medicinal herbs native to Tibet that can be cultivated in the climate of the Scottish Borders. These 21 emanations have the power and the qualities to overcome 21 different kinds of physical and mental disease. Therefore 21 different herbs connected with each of these different aspects will be planted in separate petal-shaped beds around the central statue of Tara. A Herbarium is also planned as a place for the preparation, processing and study of herbs and herbal medicine. The vegetable garden was started in the 1970s because of Akong Rinpoche’s wish for Samye Ling to have fresh, home-grown, organic produce. It has gradually evolved from an open agricultural plot to a block of allotments and now finally to a traditional kitchen garden. It is completely enclosed by thick hedgerows, and footpaths wind their way through a number of smaller gardens comprising vegetable plots, herbs, and mixed borders of fruits and flowers. There are walled gardens, workshops and potting sheds, greenhouses and cold frames, a shop, a library and an Information Centre. 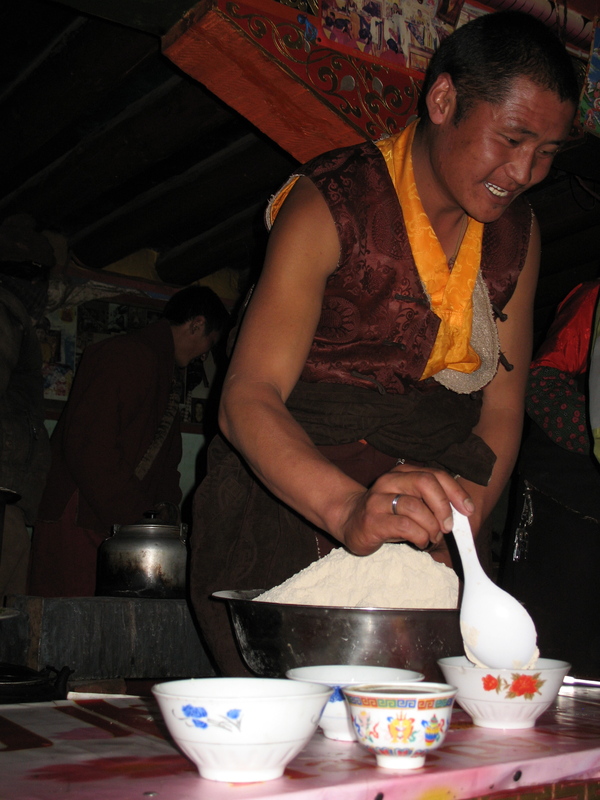 Throughout this time it has continued to provide fresh organic produce for the Samye Ling kitchen, the local community and visitors. The project funds itself through grants and donations, the sale of fresh produce and potted plants, and by delivering horticultural training courses. The work is done by a small team of dedicated and enthusiastic volunteers.